Painting by Moritz Daniel Oppenheim (1800-1882) portraying the meeting of scholars Moses Mendelsohn (1729-1786), Gotthold Ephraim Lessing (1729-1781) and theologian Johann Kaspar Lavater (1741-1801) in Berlin (1763). 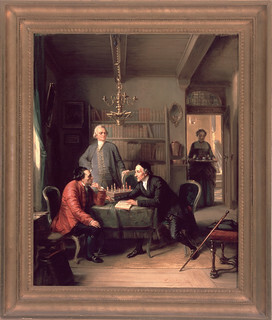 Mendelssohn is depicted on the left, wearing a red coat, and seated at a chess table in his library with Lavater. Lessing stands at the center behind the two. Above them hangs a brass lamp (Judenstern). A servant at right is holding holding a tray, under a door with a Hebrew blessing (Deuteronomy 28: 6). Accession No. : 75.18. Gift of Vernon Stroud, Eva Linker, Gerda Mathan, Ilse Feiger and Irwin Straus in memory of Frederick and Edith Straus.